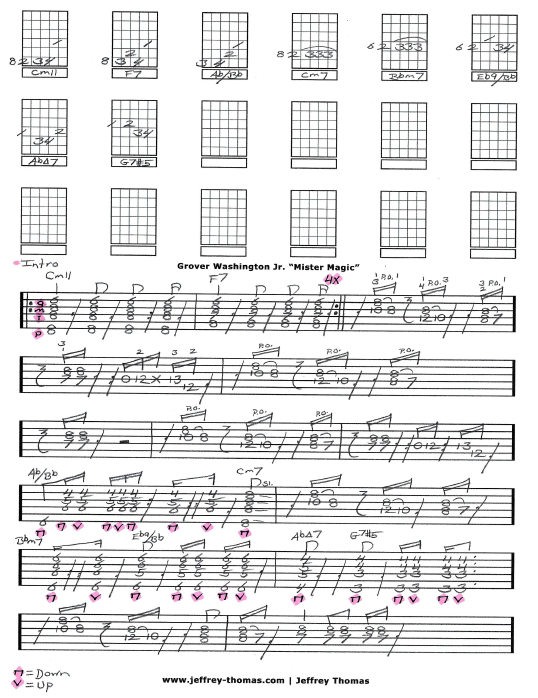 Grover Washington Jr. Mister Magic Free Guitar Tab by Jeffrey Thomas. I have page one done for this classic R&B jazz tune! Eric Gale played the great guitar lines on this track and I have done my best to get his playing accurately on paper for you. Watch the video preview for great playing tips and explanations. Want the guitar tab for free? Just send in your email address using the form provided. Looking for online guitar lessons? Fill out the Schedule A Free Lesson form to set up your free Skype guitar lesson today. “Mister Magic” topped both the jazz and soul charts and peaked at number 10 on the pop charts. Find more cool, free online guitar tabs on my blog, video and tab pages.